This product includes a two-day lesson on how natural events and human actions can affect ecosystems and the living and nonliving organisms in that ecosystem. 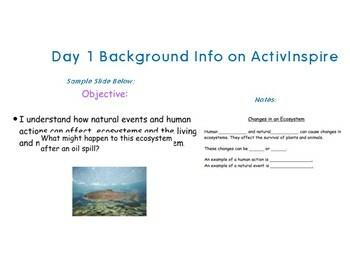 The first day includes an ActivInspire lesson and notes to teach background information on different examples of natural events and human actions and how they affect ecosystems. 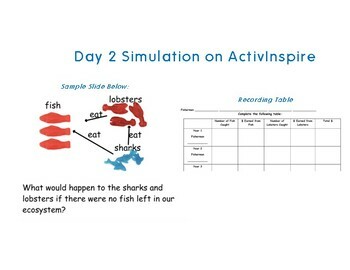 The second lesson includes a highly-engaging simulation that uses gummy sharks, lobsters, and fish to explore what happens when fishermen start overfishing in an area and how it affects the entire lake ecosystem. This also includes a recording sheet for each group.